Whether you are a patron of the theater arts, a dance parent, or a fan of dance reality TV, you are probably familiar with the structure of a ballet company. Ballet companies’ structures are typically like a one-way ladder – a dancer moves higher though the company ranks with an increase in skill and seniority. The lowest rank is typically an apprentice, followed by the corps de ballet, then soloist, and principal. The specifics and divisions vary with each company. But how is a modern company structured? Modern dance companies seem to not follow the same structure as ballet companies. There’s not really a set way to do it. How does PTDT work? You’ve seen dancers categorized in the show programs. PTDT has three divisions. 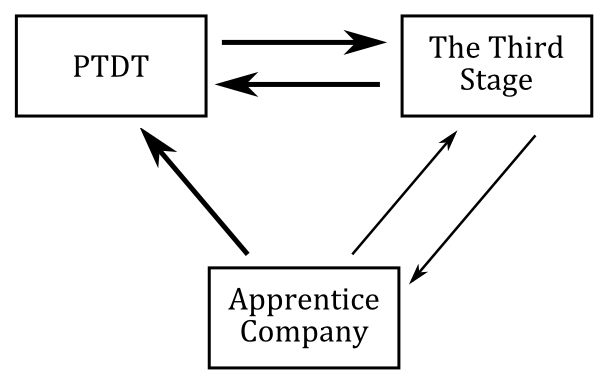 There’s the main company (often simply referred to as “PTDT”), The Third Stage, and Apprentice Company. Details about each can be found at the company’s website. Dancers can move between each division, depending on any number of factors, but the movement is not a one-way ladder like a ballet company; it’s more like a triangle. Arrows indicate movement between the different companies. The bold arrows are more common directions of movement. Younger dancers often start in the Apprentice Company, but especially young dancers or those just starting contemporary dance may start in the Third Stage. Third Stage dancers can come from the Apprentice Company, PTDT, or start there as a dancer who needs a smaller time commitment, has physical restrictions, or is new to contemporary dance. PTDT dancers can start in the Apprentice Company or Third Stage, or come into the company directly is they have significant previous training. It is fairly common for dancers to enter any of the companies by taking classes at the Dance Workshop. Within each company there isn’t a hierarchy either. Dancers all work together and help each other to learn choreography and improve their skills. Dancers also don’t usually audition for parts the way they might in a ballet company. Sometimes more dancers will have learned the choreography for a particular section than are needed. In that case, it’s common for Pamela to decide who will dance a part based on mastery of the choreography or amount of choreography a dancer needs to learn (a dancer in many other sections might need a rest on stage), or sometimes dancers volunteer to come out of a piece. Being in pieces is not competitive. Would you like to dance with any of these companies? Learn more about our 2013-2014 auditions. One other question you might be asking is, “Is it only dancers? Aren’t there other people?” And the answer is YES! There are a lot of other people who help make PTDT possible including, but not limited to, the Choreographer, the Board of Directors, Lighting Designer, Tech Crew, Ushers, Box Office Staff, and Videographer. We’ll tell you more about these people in upcoming posts.